I mix my makeup up a lot but one thing I don’t switch often is my mascara. I used to have several tubes open at the same time but since they only last a few months without drying out, that ends up being super wasteful. I purged a bunch of mascaras from my collection about a year ago and since then I’m trying to only keep one open at a time. 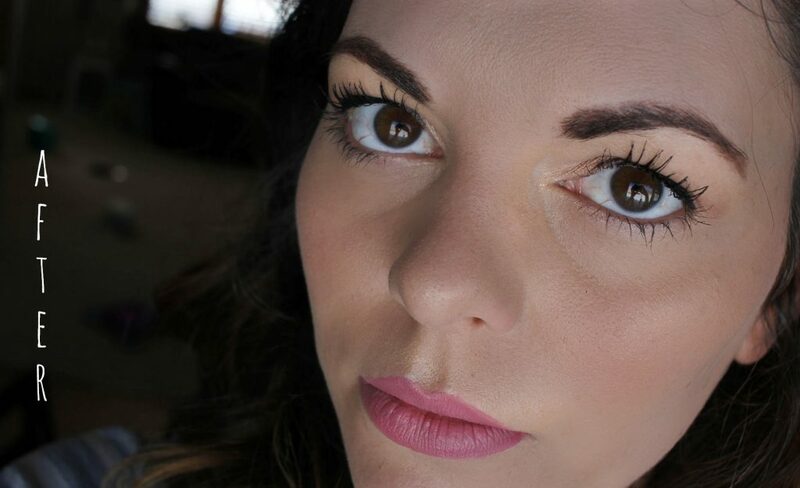 I’ve been using It Cosmetics Hello Lashes Extensions for at least a few months now, and right when I was getting ready to toss the tube, a brand new mascara appeared in my mailbox last week. 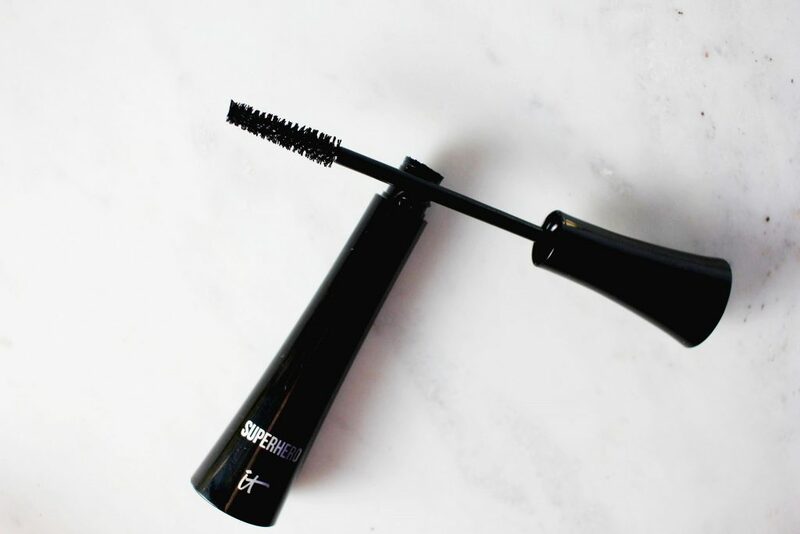 It was the It Cosmetics Superhero Elastic Stretch Volumizing Mascara*. So how does it stack up? Keep reading! 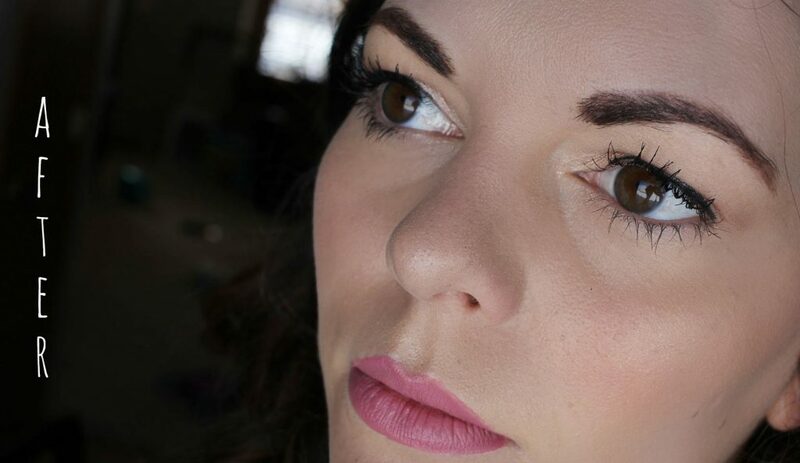 My natural lashes are thick enough but they’re pretty light and they could definitely use a boost. On a regular basis I will curl my lashes before applying mascara, but before trying this one I just left them as is. All in all, this is everything I want in a mascara. I am the type of person who is never going for a “natural lash”- I’m all about the dramatic and huge eyelashes on an every day basis. 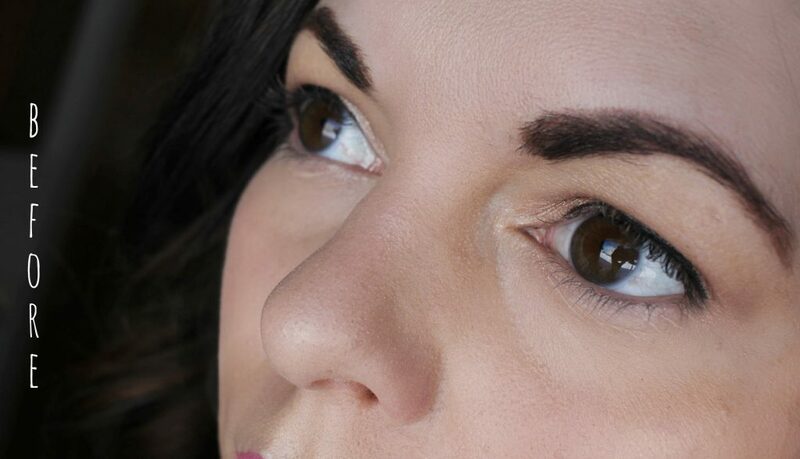 My lashes are volumized, curled, separated, and lengthened. The pigment of the formula is super-black and even as I was building layers it didn’t get spidery on me. The formula isn’t crunchy either- despite having super long and dramatic lashes, they still felt normal and not like they were going to rip out when I washed this off. And speaking of washing this off, it came off easily with cleansing oil and didn’t require extra pulling or smearing on my lashes. The day I wore this was a pretty active one. I applied it early in the morning, and went shopping and out to eat. I was in and out of the car several times- hot/cold/hot/cold and for me that’s usually a recipe for flaky, smeared mascara. I didn’t encounter any of that with the Superhero mascara. It held up pretty well, although I will admit the curl in my lashes did wilt by about halfway through the day, so you’ll need an eyelash curler to refresh if that bothers you. Of course, as with everything from It Cosmetics, there are lots of nice benefits that you won’t find in most makeup. In this formula you have a few key ingredients- volumizing collagen, hydrolyzed keratin, proteins, peptides, and biotin. All ingredients that do wonders for your lashes! So will this be a repurchase for me? The price tag is a steep $24 which is the same price as the Hello Lashes Extensions, but it works just as well. I’d say this is a splurge for sure, but a worthy one. 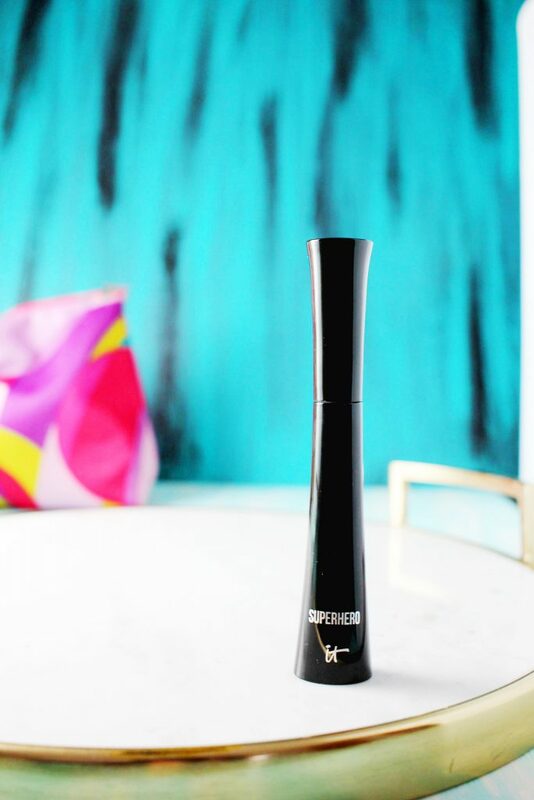 Have you heard of the new Superhero mascara? Is this something you’re going to pick up? What’s your favorite mascara? *Product sent for review. Affiliate links in use. Opinions are honest and my own. Wow, you got great results! That curl is just what my lashes need. Looks like a great mascara! I love just about everything from it Cosmetics. This is my current favorite mascara. I saw IT on QVC a couple of weeks ago demoing this product and I happened to catch it again last night when I was looking for the Westminster Dog Show. I thought it was a good deal: 2 for $26 so I went for it. I was blown away by the demo so I think it’s worth a try. You lashes are super long!! This is my new holy grail!! Love this mascara. I’ve got a few Hello Lashes in my drawer but I still plan on buying another one of the Superhero when I’m done with the one I’m using now. OMG that difference in your lashes! Well, I MUST try this then! Goodness! WOW! That is such a crazy difference. Ok. Gotta get my hands on this stat. Wow – they surely make a difference. Good to know as I haven’t tried anything from this brand. I will say though… since my lashes are so short… I tend to stray away from what might work for those with long lashes because they tend to not work for me. I would try this though. Oh my, those are some dramatic results!! Sounds like a great mascara and looks great on you! Have been using this mascara for a while but will be discontinuing to do so. Though not super expensive I have had a few setbacks. First it flakes and got in my eye and had to visit an eye Dr. and he prescribed drops he said something black had gotten in my eye I immediately knew it was the mascara. It does enhance the lashes but does not stay it flakes too easily.And messy to apply. Too bad liked product.